Loaded and Orangatang products are in some ways prestigious within the longboarding community. It’s hard not to view their products with some form of respect. The Orangatang Kegel are wheels I have wanted to try for a long time now, and for good reason. For years, they have dominated downhill podiums under the feet of the best skaters (Patrick Switzer, Mauritz Armfelt etc.) and have been used to set track records. They’ve also crossed over to long-distance pushing and are also a popular wheel for electric longboarders. It seems they can do it all. I got to try them for the first time back in February and they haven’t left my skateboard since. In my review below I break them down and describe what’s good and what’s bad. After reading it, you’ll know whether these wheels are right for you or not. How does the height affect performance? What are they great for? With its long list of accomplishments, I expected better than average performance from the wheel. This is because you simply can’t set a track record or win a race on a wheel that is just hype. and how much momentum they had. Let me start by saying that I was intimidated by this wheel. I had never skated anything that was taller than 76mm in height, so I thought that the wheel would be really heavy, give me wheel bite and make sliding hard. How did it affect it in reality though? The wheel obviously weighed more because of the extra urethane. This directly affected the acceleration and how much momentum the wheel had. I thought that the height would make the wheel more prone to wheel bite, but surprisingly that was not an issue. Unless I was skating very slow and doing very deep turns I didn’t experience any bite. It simply was not something I needed to worry about. The most enjoyable effect of the height was that it allowed the wheel to provide a smoother ride. It allowed it to handle rougher roads and ride over cracks and pebbles with ease, it made a significant difference. For me, this difference was demonstrated at a local spot that gets up to 48mph, but has really wavey pavement that feels sketchy to ride over. This is because the wavey bits cause your truck to twitch and this makes you feel like you are wobbling – with concrete barriers on the side, not really a place you want to fall! But on the Kegels, I was able to skate it full tuck all the way through without much worry of wobbles. This is directly because of their tallness and how it smoothened out the ride. It made skating the road feel less twitchy and more calm and controllable. My setup also performed a bit differently and I had to tweak it so I could have a similar turn and lean characteristics to when I had my other wheels on them. This is because my personal experience has shown me that I need to have a lower truck angle up front (44* opposed to 50*) when I have taller wheels. I’m much higher over the board and this affects how I slide. I believe I need the extra lean as it makes it easier for me to slide the wheels and keep them in control. This maybe something to think about if you get these wheels and you are finding them tough to slide. These wheels are on the heavier side. Initially, this bothered me because getting them to accelerate felt difficult. Pushing from 0 to my top speed was much harder and it sapped me of energy much quicker. However, once the wheel started moving it didn’t really want to stop. Simply meaning it had a lot of momentum. This helped me carry a ton of speed through corners and helped me maintain my speed on the flat sections of some roads. Meaning, I had to push less overall and was able to skate some roads faster than usual. In summary, they are harder to push, but once they get rolling they don’t want to stop. Also, air braking doesn’t slow you down as much so you might need to air brake earlier when you take these to your normal skate spots. As mentioned above, these wheels are really hard to get moving. They weigh more than your basic wheel and the height doesn’t aid in this either. That said, once you’ve pushed them to a relative speed, they start accelerating at about the same rate as a 75mm wheel would. I’m not 100% confident about this, but they felt quick once I got into my tuck. These wheels are heavy. This is directly because of how tall they are and the extra urethane. This might be an issue if you are commuting and need to carry your setup from place to place. However, if you are simply skating or freeriding this isn’t that much of an issue. The wheel rolls and slides like any other and you don’t notice too much for a difference. In the end, you do get used to it with time. With the skin on, the wheels provide a surprising amount of grip and slow you down quite a bit. That said, they won’t go winning you any dh races against more modern race wheels. This is because wheel technology in 2019 surpasses the technology put into these wheels. In fact, Patrick Switzer (one of the most skilled and experienced racers) came last in the 2017 Kozakov finals. He was the only one running Kegels and the rest used Fast Elephants, Venom Magnums or Cuei wheels. Putting it into perspective, he managed to get all the way to the finals, but couldn’t get to first place cause the wheels held him back. That for me signaled the end of the Kegels race career. In short, don’t get these wheels if you are trying to win a dh race. But that said, they do make great rain wheels and you see them being used a lot on the circuit. Once the skin comes off, the wheels slide with ease and slow you down decently, for me this is where they really shine. Because of this, they make great freeride and open road downhill wheels, and they perform great over a variety of surfaces and textures. The slide of the wheels can be unpredictable at times, but not in such a way that you should worry much about it. More like it will simply annoy you from time to time. So whilst the grip to slip initiation is consistent, the wheel can sometimes offer different sliding feels depending on how you weight your board and how you initiate your slide. Finally, the slide is sugary and kind of in the pavement, though this can vary depending on the surface you are skating on. For example, with chunder/rougher roads. it sometimes feels buttery and a bit more sugary. In comparison it feels more on top of the pavement on smoother roads. Unless you are skating down huge mountain roads that will need you to slide a lot, these wheels should last you a long time. They don’t wear as much as I thought they would and have worn 4mm since I started using them. I don’t expect them to last forever. When you look at the performance characteristics, it makes sense for these wheels to wear at a reasonable/fast rate. The buttery slide is synonymous with faster wearing and you simply can’t get the same performance if you make the wheel more durable. I feel like it’s one of the situation where you simply have to accept it for what it is. Simply put, this wheel is a jack of all trades and master of none of product – I can’t wholeheartedly recommend it if you are trying to win a race. For example, the downhill skate wheels for today’s market outperform this one when it comes to racing. The use of larger cores, higher rebound urethane, and wider contact patches yield faster roll speed, grip and slow down power. The way the Kegel is today means it cannot compete effectively. I do believe they will still be very competitive for long distance pushing, but I do not have the experience to back that statement up. The wheels hold a lot of momentum but the urethane doesn’t have enough rebound for fast acceleration of the line and for a higher top speed. When it comes to freeriding, open road downhill skating and commuting, these wheels are clear winners. For freeriding, the wheels become slippery and easy to manage once both the skin and lips come off. The happy-thane is very forgiving an allows for a smooth transition between gripping and slipping. Whilst in the slide, the wheel isn’t exceedingly grippy either. You can easily stand up slide them comfortably. The wheels are pretty great if you want something you can stand up slide but still put your hands down and take downhill lines with. For open-road dh skating, these wheels are exactly what you want, especially if you are doing it for the first time. These wheels offer decent slowing down power and aren’t at all difficult to control. You can take downhill lines, slow down with ease without stressing about icing out or high siding. Their large 80mm size really smooths out the ride and you can tackle wavey, rougher pavements with ease. They also slide smoothly over chunder and have a relatively consistent slide over different pavements and textures. This is where these wheels really shine. For commuting and pushing in general, these wheels are fantastic. Once you get used to how heavy they are, you enjoy the momentum and how long they can carry you for. Also, their size allows them to really smooth out the ride and provide a very comfortable skating experience on a variety of roads and surfaces. Plus, I’m pretty sure pebbles are scared of these wheels. Beginner downhill skaters need a wheel that will challenge them to get their sliding under control, but not make it exceedingly difficult for them. The Kegel is such a wheel. Once the skin is gone, the wheel slides easily and smoothly. It has a smooth transition from slip to grip, but the square-ish lips don’t make it too easy. in summary, the Kegel will allow a skater to get to grips with their sliding and encourage them to improve their technique. That said, complete beginners should stay away from this wheel as it will be too much of a challenge for them. These large wheels will provide a smooth riding experience over a variety of environments and surfaces. They will allow you to comfortably ride over cracks, pebbles and other road imperfections. Finally, once they get rolling they will not stop. They will keep their momentum and carry you further over flat surfaces. Whilst smaller wheels are better because they are easier to push out and you can manhandle them. There is something to be said about a huge wheel you can standup slide. These wheels will provide a lot of roll speed and momentum, meaning you can go for bigger slides, go faster, and enjoy a smoother the ride at your rougher spots. For open road stuff, these wheels are what you want. As I mentioned above, they are easy to slide, slow you down to decently and smooth out the ride on rougher, wavey roads. These qualities are exactly what you want for open road skating. If you can get a wheel that you can control with ease, that slows you down appropriately, slides similarly on different pavements, that will get you down the hill without fighting you much, then thats a product you should take very seriously. The Kegels meet all these requirements with ease. I skated them down a chunder run, sliding over wavey pavement that differed in texture. These wheels made it all too easy and honestly kind of ruined the fun of the challenge for me. My conclusion would be a yes, but only if you use them for the right purpose. As an all-round wheel that will perform decently and last you a decent amount of time, they are totally worth it. So yes, whilst they won’t win you any races or be the most durable, the Kegels will put a smile on your face. You can buy yourself a set on the loaded website here. 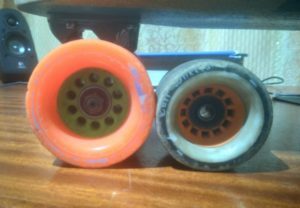 ← Skateboard & Longboard bearings, which are the fastest?